Here at Bayberry Hollow we offer a wide range of gift vouchers. Whether it is a gift for a loved one, friend or family member, they are sure to find something they love at Bayberry Hollow! Our gift vouchers are available for Afternoon Tea (you can add prosecco for that extra special treat) or to spend across our cafe and gift shop. Afternoon tea is a treat enjoyed by many. You are served a fresh selection of sandwiches with salad and crisps. A sweet, freshly baked, scone with clotted cream and jam is on the second tier. For those who can manage to eat the top tier, we have classic Victoria sponge cake and chocolate dipped strawberries. All of this is served with unlimited award winning Americano coffee and tea. Our afternoon tea is also available as a gluten free and vegetarian option. 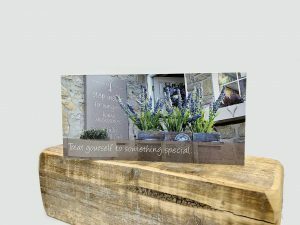 Our cafe and gift shop vouchers allow the recipient to spend their voucher as they please across our cafe and gift shop. Whether it be something new for their home followed by a delicious cake in our cafe, or a slice of fresh quiche with a glass of wine, they have the freedom to choose what they like! If you would like to send your gift voucher directly to the recipient please select ‘deliver to an alternative address’ at checkout, and write the message for the card in the order comments box.